Basketball practice, dance rehearsals, meeting with friends, and other scheduling conflicts make family dinner time seem like an activity from the past. Suddenly, we find ourselves feeding the kids breakfast bars during their morning travel to school, eating unhealthy things for lunch, then grabbing everyone’s dinner at the nearest drive-thru fast food joint. In this fast paced environment mixed with everyone’s busy schedule, it is extremely difficult to have genuine family dinner time with everyone; but families today may not really be aware of the numerous benefits that eating together has. Based on studies, it is said that having dinner together as a family has a positive and great effect on the development of a child; plus, it has also been linked to decreasing the risks of obesity, eating disorders, substance abuse, and also the increased chances of graduating from high school. Eating together gives the chance for great conversation; it allows the parents to actually teach their kids a healthy moment of communication without distractions coming from gadgets, smartphones, television, and more. When you engage your kids in conversation, you will be teaching them how to listen to others while also giving them the chance to express their own opinions; this will allow your kids to realize that they can speak and have an active voice in the family. The sense of security and closeness shared by the family during dinner time can help nurture your kids into well-rounded, caring, and healthy adults. Frequent moments of eating together also have a positive impact on the kids’ values, self-esteem, motivation, as well as their personal identity. 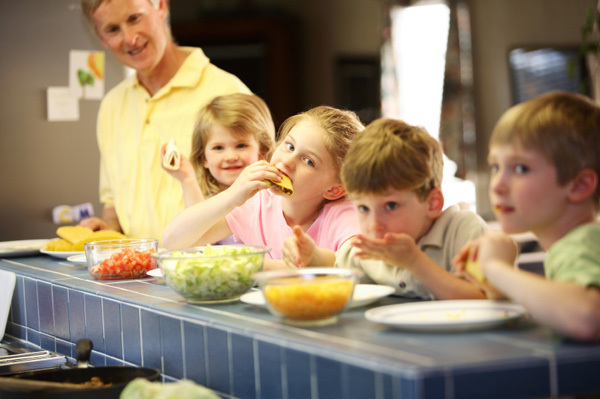 When your family eats together, children less likely become obese or overweight since they are able to eat regular, healthy and nutritious homemade meals that are served to them in normal proportions that are just adequate for them. To make the most out of the family mealtime bonding, you can try cooking together as a family to make things more intimate and genuine; enjoy the homemade meal while engaging in great conversations before heading out to bond more with the family. Enjoying each other’s company while relaxing out in the backyard is a nice way to spend more time with the family, especially when everyone can also play and launch the Whistlecopter toys that fly high while sparkling beautifully like fireworks in the night’s sky.